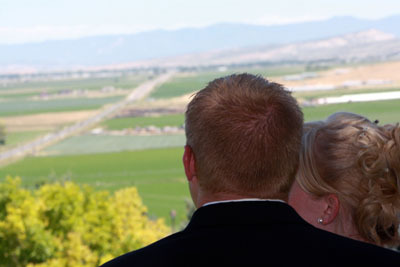 Off Wellman Way: How Did We Do A 2 Reception Temple Wedding? How Did We Do A 2 Reception Temple Wedding? The place wasn't hard for my daughter's choice of a Temple Marriage. Her great-grandparents were married here at the Manti Temple. They were her Grandpa Doug's parents and their parents were sealed here also. 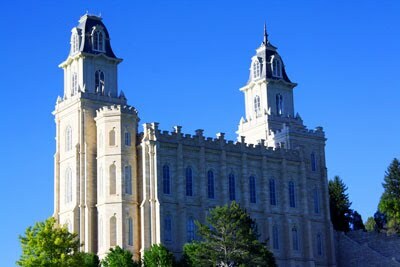 It would have been easier for us for her to have it at the L.A. Temple where we were married, but even Matthew had asked her at the Manti Temple to be married. They both had done lots of work there together for Temple trips. How could I then just say, it has to be at your home? This is home for her and just down the road from where she had been living at college. Matthew gave Kiely such a lovely bouquet of fragrant lilies, daisies, roses and brown blooming grasses. It was gorgeous and caught the eye of every other bride at the Temple that day. I'm not just saying that...they told us. Don't you ever wonder what newlyweds are thinking and whispering to each other. 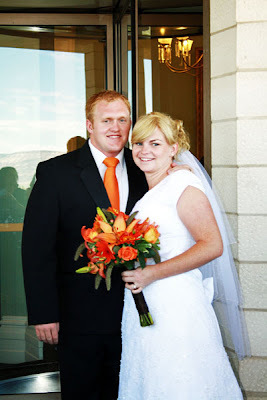 This is me and my husband donning the designated orange. We are the producers of the receptions. The colors Kiely had picked could not be found in May, June, and July. Her color of orange I think was because every morning, all during high school, she woke-up and went to sleep gazing at this beautiful Hawaiian mural that covers the long, long wall of her bedroom and she also picked brown because it just matched her cowgirl leather image. 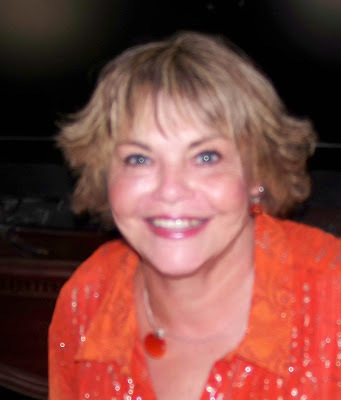 And, as mentioned in the previous post her favorite song is, "Scatter Sunshine" Orange is the color with highlights and yellow sunbeams. Our town of Santa Paula is the citrus capitol of the world. We have lots of oranges and mornings are often orange. Yes, she did have early morning seminary and on the weekends were the milking chores to give me a break, so she always saw the sunrise and sunset. 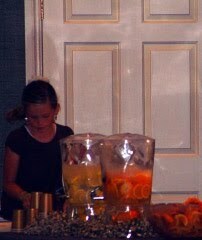 Yes, orange was the color. This is Bree, Kiely's sister and the main person in charge of pictures. She has an amazing eye and actually majored in photography in college. We were blessed with her talent and organized ballet of moving the different subjects to their marks. 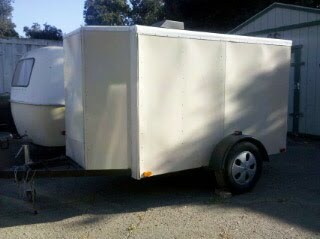 Below is the sweet little box trailer that we hauled all the decorations to Utah that we had worked so hard to find. Plus every single thing Kiely wanted from here. Her stuff, as in her bed and she moved-out. I promised I wouldn't even look at the things she was throwing away. I didn't. The big bedroom that held at one time, five girls, is now missing one little girl. Guests were arriving even before our decorating started so family dove-in and placed everything much better than I could have ever done. There was no delegating. They jumped in and did it. My girls all got together to strap Kiely up in her gown. Lots of laces and in the meantime as Bree is taking the pictures the three found-out why Kiely and Matt were late to the reception, too. But it wasn't because they were lost. All the little ones went to the nursery to play and they had a wonderful time, I think. I was exhausted. I tried to put it all out. And only really managed to set-out the heritage costumes from Scotland and Norway. We were so in a hurry one of our dearest guests just whipped-out his Bowie Knife and used it to trim the tulle. Perfect! Yeeeaahh, cowboy! A dear friend a fire captain brother, Jerry Byrum made a program for everyone to watch after going through the receiving line. 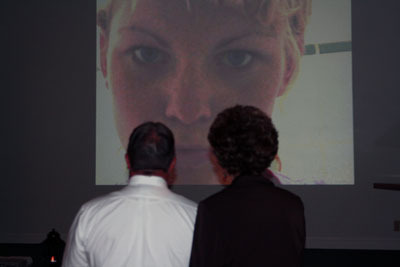 How incredible is it that Kiely and Matt two states away from each other, lead such parallel lives? They knew who they would eventually marry because they were sure that person was out-there somewhere. 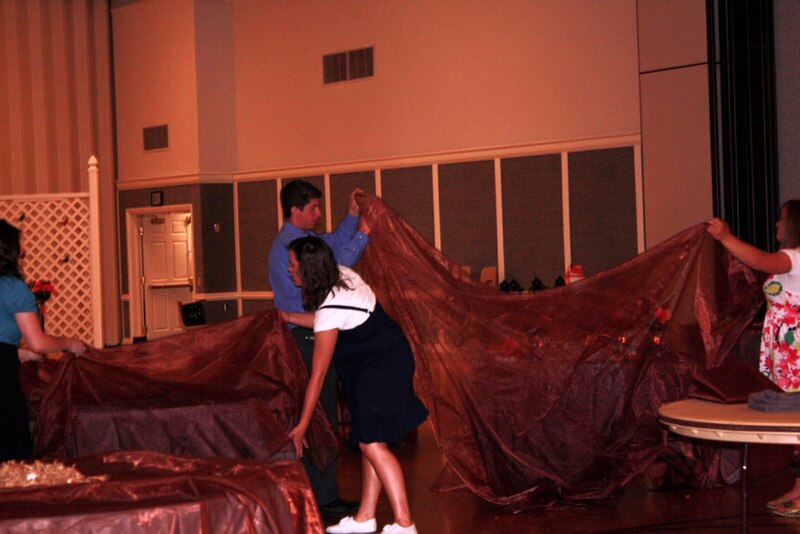 Kiely even prayed for Matthew while he served his mission when she turned 17 and had her Patriarchal Blessing. 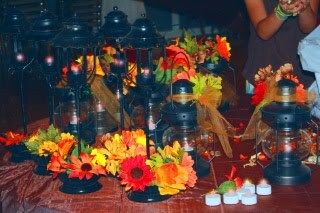 The flowers were almost all from the Dollar Tree and the lanterns from Big Lots. The little fake candles were also from the Dollar Tree. Steve and I dyed a bunch of sheets from our years supply. We didn't care that they were brown. They weren't brown exactly. I could have saved money here and bought Ritz, cheap dye. The stuff I bought was over $70.00 and didn't work as well as they claimed. Use Ritz, it's better. 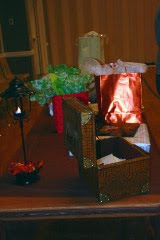 My Bree bought the table covers for only $6.00 each and they are gossamer, beautiful, very large, and super shiny. 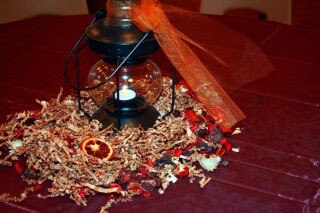 They were lovely and made each table light-up. 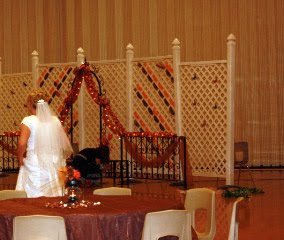 The beautiful lattice and wrought iron was Matthew's family's own decorations for the family weddings. I can see that making it in advance is a smart investment and can be used in your own yard until the wedding begin. It's just a matter of "upkeep" and the days of youth are very short. My baby is married. The lights on the archway were my Christmas lights and then I bought four garlands of Gerbera Daisies to decorate the arch and the stanchion that lead the way for the receiving line. Kiely's old leather make-up box was the right color so, hey! Why not we used it for the cards? Tressa, Kiely's older sister made the guest book. It is lovely. Tressa teaches art and so nothing could be more elegant as crystals and pearls adorning the pen and book. She had even scripted calligraphy on the front of the book with Kiely and Matt's names. Kiely and Matt bought these beautiful beverage containers at Costco. They look like glass but are plastic. 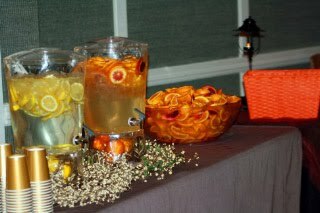 They have a place in the bottom to hold ice, but they choose to have oranges and lemons in the bottom and the drink, water with orange and blood oranges. Super sweet. The candy treats were a gift from another firefighter that also works for Sunkist. He bought Kiely and Matt a huge case of candy. They are Sunkist Gems. I've had those for every Christmas I can remember and although they are candy, they have real fruit in them. It wouldn't have been right to show the oranges and not have a big bowl of cut-up oranges. Utah people avoided the red, blood oranges until word got around and everyone was picking though the large bowl to find the very sweet, red ones. The oranges were free and off our trees. The beverage was free and it was Utah water. Very refreshing on such a hot day. All the cups, plates, napkins and forks were from the 99 cents store The baskets were also at the Dollar Tree and Marnie took the beautiful long garland of tiny white buds off her wall and brought them to help decorate the refreshment table. 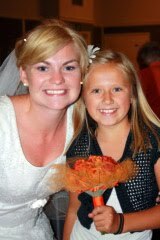 This is one of the little flower girls. 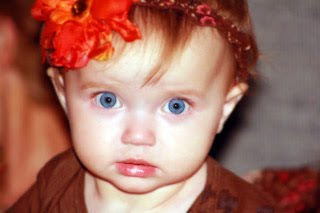 My granddaughter, Finlee. We never, ever thought orange would be so wonderful, so bright, so different, and so flattering to our skin tones. 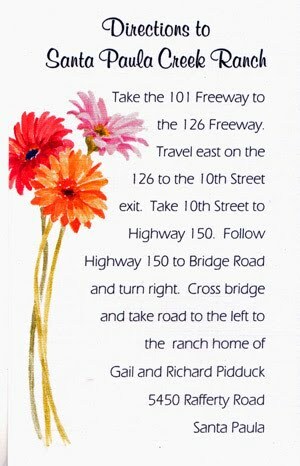 This is Kiely's fake arrangement for when she comes back home to Santa Paula for her open house. 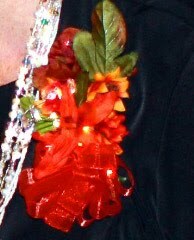 I made it with the corsages and buttonieers . 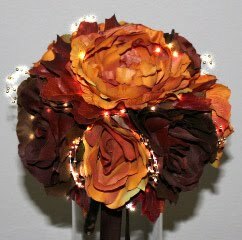 I added crystals from a Christmas garland on sale at Michael's Hobby Store and the bouquet is just small bouquets from the same store wrapped together with brown ribbon. and pinned. I also put tiny Christmas lights (very tiny) from Michael's or the Dollar Tree...I can't remember. But for sure they were about the same price. Cheap... and the lights added so much sparkle. I added crystal to the corsages and every picture with the corsages just popped with light. I used a strip of stiff flannel for the backing and put two jewelry backs, so as not to stab anyone with pins. I laid the strip-out and then used about 5 flower tops glued to the flannel and then I made the ribbon bows from sheer ribbon from yes, you guessed it, Dollar Tree, again. Everyone's was just a bit different and all had lots of love put in each one. I didn't remember to recollect some at the end to use at the next reception, so I just made more. Now, I think I want one for each of my church dresses. It was so easy and everyone loved them. The best part...never dying and always easy to put on and they stay where they are pinned with the backing of the jewelry findings. 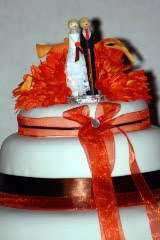 lots of orange tulle and ribbon. The men's buttonieers were actually a bit harder. Kiely wanted Gerbera Daisies for everything. Well, sorry. My whole life I remember clowns wearing daisy buttonieers and honestly, I can only look at one of "those" and think water squirting-out of them. So, I added a couple of little daisies or similar flowers and ribbons around to not make them so flat. 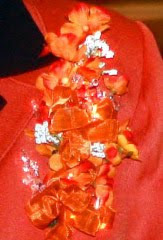 Yes, they also had a jewelry fastener, pin-back on the stiff felt. The felt is a great base. 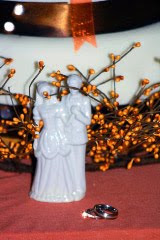 Cake statues or toppers were bought at the Dollar Tree and absolutely the only place I could find some that were old fashioned and the dress actually LOOKED like a modest temple dress. I bought lots of them and we circled the cake and put them also on the refreshment table. 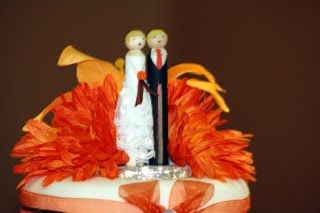 Kiely and Matt made the real cake topper. We didn't think they would really use it,but it was so cute and so Kiely. We all loved it. Two clothes-pins dressed-up. This is THE FAKE CAKE. 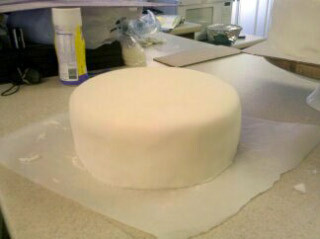 All was cream fondant covering Styrofoam. 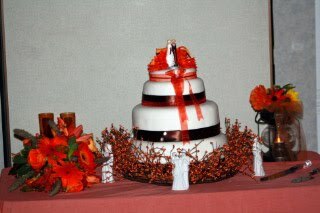 All except the top which is the Bride's and Groom cake and it was cheese cake. Larin, Kiely's sister in Utah, make the whole thing herself, twice. The first time the weather melted it and she remade it the day before...all day. Just like me and the corsages. I need to note here that we had tons of eatable cake. My daughters got together and gifted the couple with Costco cakes and served them in the kitchen with some much needed help from our dearest guests. 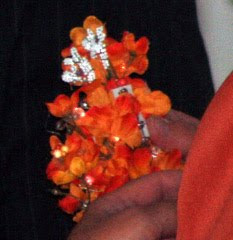 The brown goblets again were from the Dollar Tree and the orange bud garland was from Michael's on sale. How could I resist? Sorry, Steve. 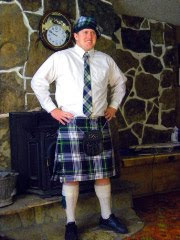 This is Matthew in the traditional kilt and and family clan and Gordon (?) tartan. I think that's what Matthew's Scottish grandfather told me. My head was spinning and focus...maybe it was the Cooper Clan. Matt has all the accessories and it's so unique that both had such strong family heritage and that they could actually display them. Scottish Toast to the Bride and Groom. This was not said because all of us on the other side wouldn't have had a clue. We still don't. As I wish ye aya to be. 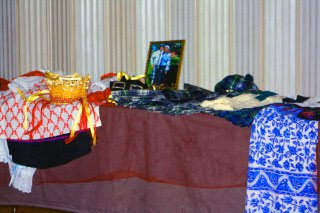 Here's our heritage display. Our Norwegian girl with traditional Bunad from Steinkjer, Nord-Trøndelag, Norway. Kiely does have a little Scottish from my side of the family and my mother while in Scotland bought Kiely her lassie kilt in the clan of McKeans and they have the MacDonald tartan. It was the dress Tartan and the buttons of the velvet vest are nickle silver with the thistle emblem of Scotland on each one. I didn't notice until the reception and setting each item on the table. Kiely has had the folk costume since she was four. The Norwegian Folkwear Bunad was made not just because Kiely loved it, but because I needed a heritage project for my Young Woman's Award. 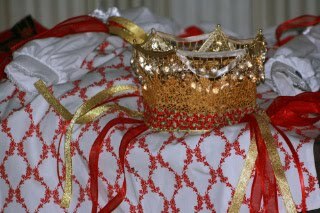 I didn't know I'd be adding so much more with the wedding dress and crown. Ephraim is in the middle a Scandinavian pioneer settlement. How fitting that she have these beautiful duds. 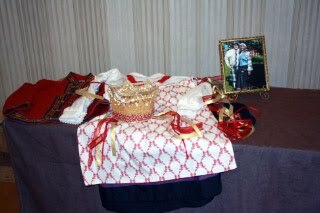 Kiely's Bunad with the blue apron and vest, embroidered hat, and old purse are also on display as well as her Bunad shoes. She didn't have a SØLJER jewelry piece, but maybe later when? Anniversary, maybe? The little spoons that ward-off bad influences are just what I would think Kiely would love. Kiely loves fishing, so tiny spoon lures attached to a pin and from her husband as a gift for her. Perfect! I was so tired. Everything was put-up and needed to be taken down. Kiely's Student Leadership Group came to the reception. Not too many students stay during summer, but the Leadership Team goes to classes and seminars. They have bonding time. Yes, they decorated the car very cute and then all together and in such an organized group, they just took everything down, put it all away in a very organized fashion. It was so quick that it seemed one minute it was all up and beautiful, and the next... Abracadabra! 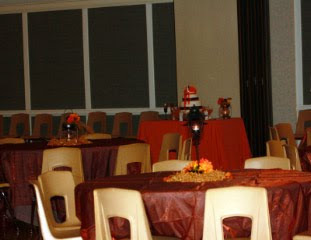 The decorations were all down and the cultural hall was ready for Sunday. First: Should have taken great care in the sending of invitations. I knew I counted right, but there were lots left over. 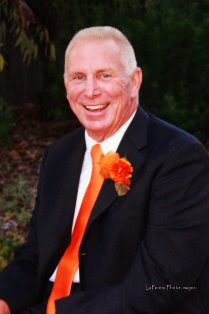 We missed some dear friends and even Steve's very best friend, Randy Woodall and his family in Roy, Utah. But, they came anyway and it made my husband cry. Facebook is really nice that way...they new what was going on and they just came. Wow. I should never had a contact number out there and available for all the world to see. I now have a caller that I don't know calling me day and night. Yes, the police are involved. Weird, huh? I should have gotten a DJ. The aunts kept turning down the music. The Father/Daughter dance had almost to no music. The bride and groom dance was okay. Steve's aunts turned it up a little for that one, but the groom and his mother...volume down again, so they all could visit. And that's okay because Steve's mother needed to visit. A DJ could have moved the equipment, been entertaining, less irritating to all of Steve's aunts, and my worries. Lesson learned. I bought way to much tulle for decorating. Too much ribbon, and too many flowers. 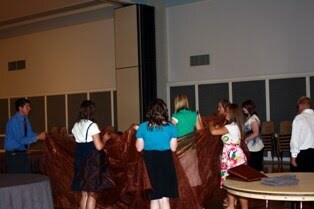 The whole Stake Center Cultural Hall would have been covered, including the chairs, if I had used it all. Okay...being late has its advantages. I bought clothes that were too hot to wear. What was I thinking? July in Utah...it's like desert. The tablecloths that we had dyed were really a very dark brownish purple (more purple) but they couldn't be seen through the table covers. So, I wasted money on trying to dye them twice and also, I shouldn't have folded them so carefully, they were covered! No one was going to get off their galloping horse to look under the table covers or even look closely at the table covers. They were shiny and sparkly, and I loved them. The worst mistake was that we should have had another time to decorate the Cultural Hall. We should have made it smaller and more intimate, with dividers. It was a huge place, but thankfully no basketball hoops in sight. The scouts had something the night before and the building had an activity for Saturday so clean-up had to be right away, also. I honestly would have come after the Scout Meeting, even if it was late. I would have been rested and calm during the reception. The event was just a blur to me because I was so tired. Everything about the reception would have been much easier. We packed our food for our trip up to Utah, so we didn't really eat on the run by going through gas stations or drive-through places for snacks and junk food. But, by the time we went home all that "went-out-the-window." We should have prepared like we did coming out, we would have felt better, and the money saving would have been significant. Good choice was to arrive at the Temple early. 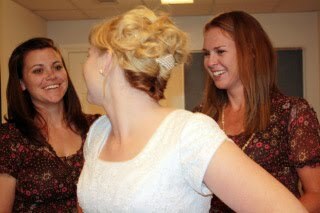 We were not rushed and their were a lot of brides, even on a Friday. A couple of other Temples in Utah were having renovations. One, was the Provo Temple. We had a wonderful and beautiful time in the Bride's dressing room and we able to visit quietly in the front foyer area before we ascended the spiral staircase to the tower sealing room. Utah is the place to buy dresses, that's for sure. Here's the SAME dress Kiely was going to order from an online firm and have it made in Asia. This dress was also on sale, but Kiely had it already picked-out, it wasn't the sale (plus) it was the same dress and it was much less money. 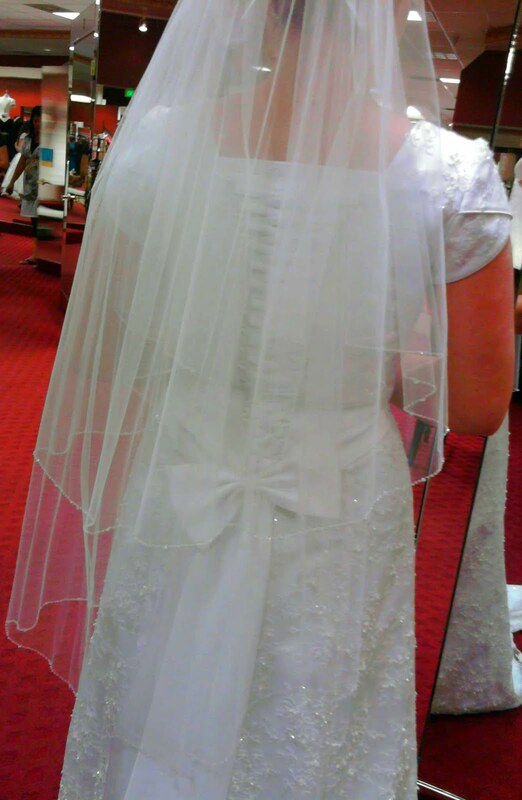 The veil that she picked was perfect because I couldn't have made a veil that was equal to what she found in Utah. The materials to make the veil would have been more than the store-bought one she loved. I wasn't there to help. 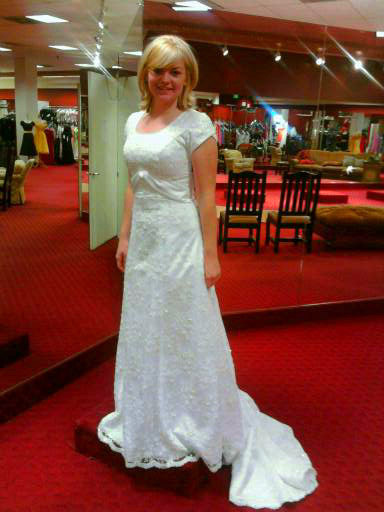 But this was the dress she wanted. Camera phones are a great invention because I felt like I was there. 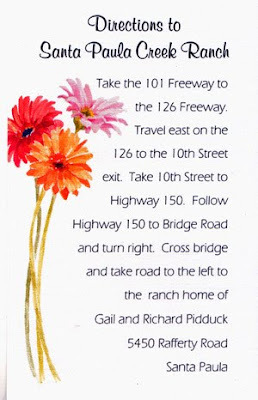 My friend, Gail drew the little direction insert for the second reception. How interesting that the flowers were Gerbera Daisies and there's the orange one. Matthew's uncle took the engagement pictures at his ranch with his camera and I placed them on a template I made. 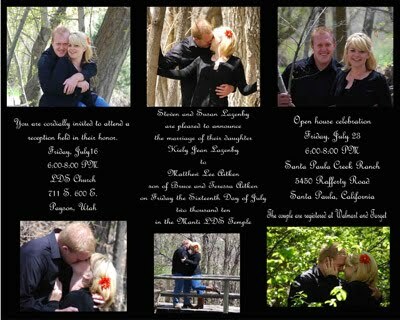 Matthew and Kiely took them to Costco and had them printed-up as photographs to send as invitations. More on the second Reception....I need to sleep.